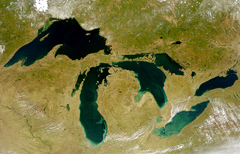 The Wisconsin state Senate has approved the Great Lakes Compact, moving the state a step closer to ratifying the multi-state document which has as its goal the protection of the Great Lakes — and their water. Sen. Mark Miller (D-Monona) said four states have already ratified the multi-state compact to protect the lakes, and he announced on the Senate floor that the Michigan state Senate approved the compact Wednesday morning on a 38-0 vote. The lakes, said Miller, “do not belong to any state, they belong to all of us. They are a shared resource. The compact does not diminish Wisconsin&apos;s sovereignty. The compact enhances Wisconsin&apos;s sovereignty, by giving Wisconsin an equal and strong voice,” in the lakes&apos; management, Miller said. Green Bay Republican Rob Cowles said the compact is needed to prevent what he calls “catastrophic” diversions of Great Lakes water. “We&apos;re getting closer, and then we have to put pressure on Washington,” said Cowles. “But if we don&apos;t do this, we&apos;re in harms way.” New Berlin Republican Mary Lazich was the lone nay-sayer. “I am concerned that this document comes up short,” Lazich said. Lazich peppered Miller with questions before the Senate, in a congratulatory mood, passed the enabling legislation on a 32-1 vote. The compact must be approved by all eight Great Lakes states, and the U.S. Congress, in order to go into effect. Wednesday&apos;s special session vote marked the second time the state Senate approved the measure. It failed to pass the Assembly after Senate passage during the regular session in March. The Assembly is scheduled to take up the bill on Thursday, and Governor Jim Doyle has said he&apos;ll sign it when it reaches his desk.